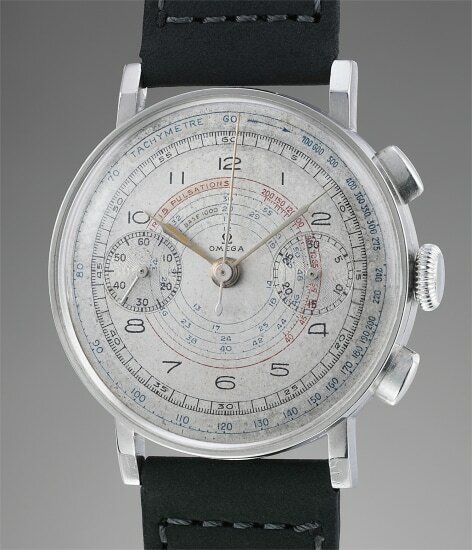 This extremely well-preserved stainless steel chronograph wristwatch most notably displays an impressive multi-tone grey dial with both tachymeter and pulsations scales. Printed in different shades, the scales range from blue to red, giving this watch a lot of charisma and depth. Contrasting against the Arabic numerals, the effect is stunning. The present chronograph display's Omega’s incredible know-how in creating chronograph wristwatches. Housing the iconic 33.3 caliber, this example is preserved in excellent condition, with sharp angled lugs that do not display signs of over polishing. The 37.5 millimeter case is very large for the period, its presence enhanced by the three dimensional angled lugs. It is particularly impressive that Omega had the foresight to create such a large and modern looking watch in the late 1930s. Research with the manufacture reveals that this timepiece was sold to Italy in 1939.